Good To Begin Well, Better To End Well: An Award! Hooray! I'm going to have to be kind of unplugged and take the next couple weeks off of blogging. I know, I know-- it is going to be sad for me too! I will totally miss you guys. BUT I am going to be away for the next 12 days, and then I have some company coming from faraway lands. If I have time, or something big comes along, I'll post, but consider me scheduleless, and the posts to be bonus content until July 16th! To sweeten the bitterness of my absence, I thought I'd build some goodwill by sharing an award! 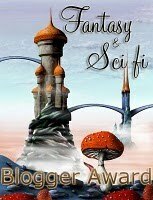 Recently, I received the Fantasy and Sci Fi Blogger Award, from David J. West over at Nephite Blood, Spartan Heart. Thanks David! I'm kind of stoked about it, since I'm not sure there is another award of its ilk around. At least not that I know of. ANYWAY. It comes with rules! I must name five fantasy/sci-fi books or movies that have inspired me, then pass it on to five fellow bloggers! Picking Five books or movies is hard. But! I will try to make it happen! 1) The Original Star Wars Trilogy. This is hands down number one in all things. I could have cheated and listed each of the three movies individually but... well. That would have been lame. 2) The Rowan by Anne McCaffrey. I love Rowan. And I love, love, love Jeff Raven. And the entirety of the Talent series, actually! The Rowan is not the best book ever written by Anne McCaffrey, but the characters are so alive and the world so amazing that it really fired my imagination in a lot of ways. 3) Stranger in a Strange Land by R.A. Heinlein. It goes without saying that Heinlein is amazing, brilliant, and a founding father of modern science fiction. But I just said it anyway. This book, along with The Cat Who Walks Through Walls and I Will Fear No Evil and Friday really influenced me as a teenager. 4) Like I didn't just name four books in that last one... But, I have to say that the Dragonriders of Pern make my list, by Anne McCaffrey. Great world building without taking away at all from the characters and their development. She works with such a large cast of characters, but she weaves them together so well! 5) The Crystal Singer Trilogy (Yeah, okay, so I read a lot of Anne McCaffrey in my youth). Because I defy anyone to read Killashandra and NOT fall in love a little bit with Lars Dahl. He's so perfect for Killa. It's like Lois Lane and Clark Kent. Don't worry, I'll still be reading your blogs! And I will probably even be tweeting normally during this hiatus! HOPEFULLY, though, with the break from blogging and the vay-cay, I can get some serious progress made in Helen's rewrite, AND I will definitely be making a Cameo for a blogfest here or there. In Particular, the Bickering Blogfest hosted by Kristen on June 30th! Have a fabulous weekend, friends and followers! So stoked about this! What a rad award. I could never get into Heinlein but I was all about the Pern books back in the day. I loved how the first one was more sci-fi and then she took it to total fantasy. A beautiful blending of the two genres. Enjoy your trip- I hope you're going somewhere wonderfully fun and exciting! And congrats on the award- that one's nifty! T-T THANK YOU SO MUCH!!! This does mean a lot to me that you've read and like my stuff. You've been such an inspiration to me. I hope your hiatus is as recharging and inspiring as you need it to be (I have to take one in a few weeks too). Awesome award! Congratulations to both you and the awardees! I loved Stranger in a Strange Land. If fact, I really should read it again. We'll miss you while you're away. Have a great two weeks!!! David: I might be biased. The Rowan is definitely not as polished as the later books. There are some pretty big errors in it, but I love love the characters. And I HIGHLY recommend the Crystal Singer trilogy. HIGHLY. In fact, that should have probably been higher up the list. It's great! Aubrie: This award is awesome! Thanks for creating it! Valerie: (it is totally weird to me to address you that way, by the way) I think you're right. The blend of sci-fi and fantasy in the Pern series is really fabulous. Have you read the Crystal Singer Trilogy? Because I love them. Not just for the relationships. But also because they are awesome! It kind of takes place in the same universe as the Brainships exist in? kind of. Anyway, they are awesome books. Monica: D'aww! Thanks! Your Thoki and Lor stuff is awesome and a great take! I'm love to see other takes on North Mythology! VR: Stranger in a Strange Land really is an awesome book. You should definitely read I Will Fear No Evil though, if you haven't! It is REALLY fascinating! Congrats!! I love your blog!